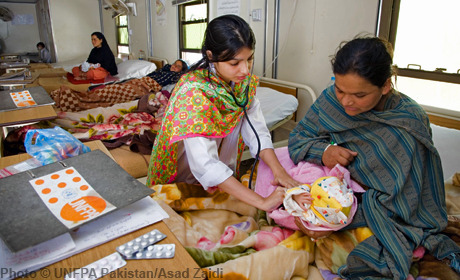 The world’s sixth most populous country, Pakistan contends with the risk of natural disasters, a large and growing youth bulge, and entrenched poverty and inequality, all of which pose significant challenges to delivering reproductive health services. The contraceptive prevalence rate has stagnated, along with a very low number of skilled-attendance at births. Through policy advocacy and national capacity development, UNFPA helps to accelerate progress on MDG5 for a quality and increased coverage of reproductive health and family planning services. UNFPA also supports the strengthening of data collection and analysis related to population issues.